Addis Ababa sneaks up on you under the cover of darkness and smashes into your senses at the first light of day. Molasses mixed with gasoline and diesel spews from exhaust pipes, filling the grills of the public lines packed with humanity. Everything under the African sun thuds into 250 square kilometers of valley and pumps out a life bursting with tenacity. Dirty, dusty and polluted—Africa’s 4th largest city is… surprisingly easy. Catch a minibus from the roadside to a nearest transport hub and in an hour the whole sprawl is at your fingertips for less than a dollar (at the time of writing, 12 birr equals one US$1). Hiking trails along the outskirts dot mountaintops. Splashes of exotic cuisine from local injera to pans of pizza pie ring the clock. Shopping malls for the elite and markets for the audacious (the Merkato being Africa’s largest) is vibrant with traditional to global commerce. And nightlife thumps with labels of alcohol from around the world. So how do you begin to navigate a rumpled city of 3 million people? The answer: Step out onto the street, buy a bag of avocados from a vender, sit down on a stool to spoon a mixed juice (called spress) down your gullet and take a stroll. Wander. Breathe. Smile at the smooth faces of Ethiopia. And ask lots of questions. You’re sure to find an answer. Lily and I were riding a minibus to the Merkato. Caught up by the innocent face of a child hung over the seat before us, I started photographing. Everywhere in the city, strangers touch the heads of young kids as a sign of admiration. In general, adults are physical. They grab fingers when talking. Arms wrap around shoulders. Men walk together hand in hand as friends. People care for people. Children care for children. Society is one grandiose family, including the homeless who gain their wages begging in the streets for their days’ meals—and they make it. As we poked at the giggling youth, other passengers paid attention and brought the child’s cheeks from brown to maroon red. 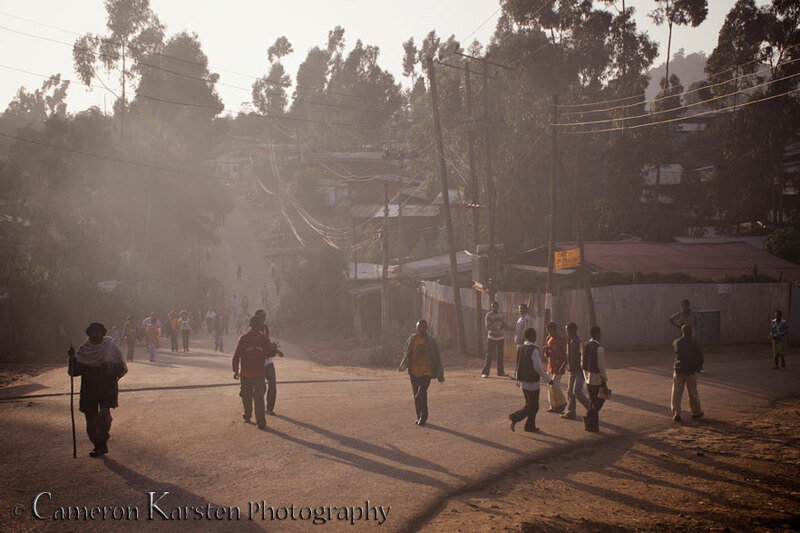 Shortly, we reached the market; disembarked and walked into what the majority of locals (called habisha) and all foreigners (known as ferenge) consider the most dangerous neighborhood in all Addis Ababa. This is the essence of Ethiopian kindness. For three hours Endalk the Journaling Sprinter led us through a maze of alleys, shops and culture. However, being a Sunday in a country of Orthodox Christians and devote Muslims, the market was low-key; not the expected miasmic chaos of an African bazaar deemed the largest of such a continent. We felt safe. We felt calm. Yet faces turned towards ours while eyes beamed into our souls. Undoubtedly, Lily and I were the only western individuals pasted white in a sea of slick black, and we were the only ones carrying backpacks seeping of a camera, two US passports and wads of cash. Bodies were everywhere—clean, dirty, ragged and crisp. Humanity was thriving in all the ways possible. In the hours of strolling, our conversation ranged from the political to the orthodox to the relaxation of companions from varying cultures familiarizing one another. Before long, we’re facing a group of Endalk’s friends in a small chat hut. The room was square, roughly 4 feet by 5 feet, crammed with six bodies. 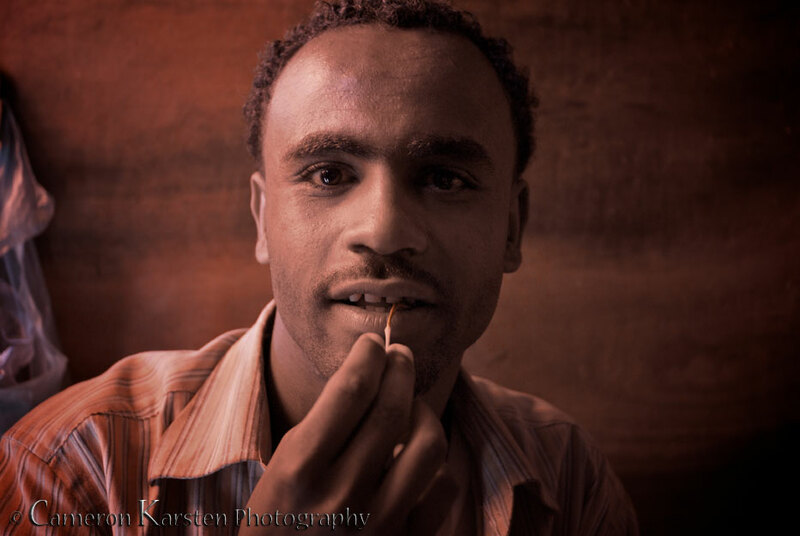 Chewing chat with a cluster of warm-hearted strangers in Ethiopia is akin to nirvana. Lily and I were out of the sun in cool shade, hydrating our bodies while resting our feet with a cheek full of chat among new friends. Swallowing, we nodded. “Of course,” we answered. Smiles, laughter, Obama claps, and chat. We took our leave under the wing of Endalk and continued exploring. One deranged thing about Addis is a crosswalk. In the West, crosswalks symbolize the movement of feet and the respect of self-transportation. Engines halt. Machines rest. Bipedals progress. Yet in Addis, like most otherworldly metropolises, the foot passenger is at the bottom of the food chain while spewing beasts of metal, steel and oil surge to the top lost behind the obscurity of their blindfolds. Cross streets with care. Look both ways, then look again in both directions before stepping into the streets. Remember: Don’t hold your breath, and at the slightest breach of traffic (and with keen judgment in self-care) shuffle swiftly. Cars won’t stop and buses won’t forgo their passenger’s eye; in fact, drivers will accelerate at the sight of your vulnerability. It’s all or nothing when crossing a busy street, especially in darkness when impaired judgment is tenfold like a deer in headlights. So be a wise mammal, one with a head on its shoulders and a big warm-blooded heart. Breathe in the African air, even when passing those green rivers that emit the scent of raw feces stirring in an eternal batch of brown foam. And don’t mind the random dismembered goat heads lying in the ditches and the rocky dirt roads torn asunder by torrential rains. Remember to smile, be brave, and realize we’re all one people. When in Ethiopia, give praise to the culture’s independence, which arises from a history that bubbles with creation and sustenance. 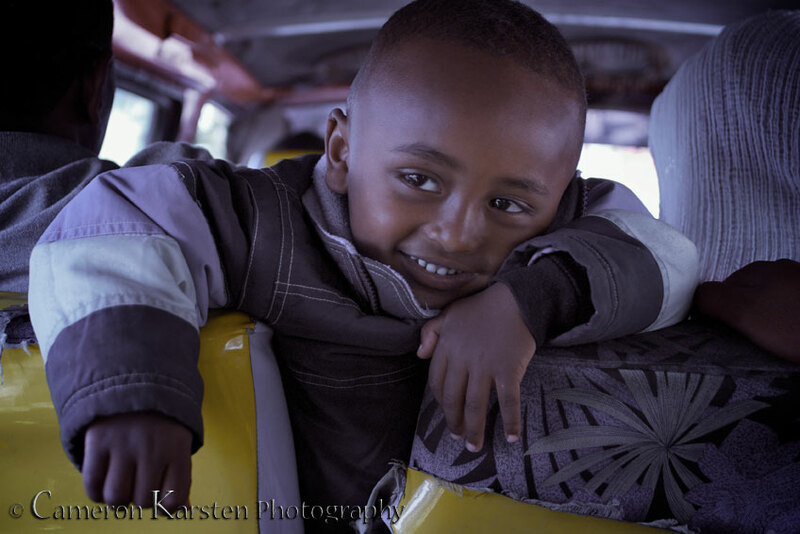 Sweetness is aplenty in Addis Ababa, a city whose English translation means “New Flower”. She is a beautiful one indeed. Cameron, would you be willing to contribute some travel writing content to my new website embark365.com? I will put a link to your blog on there. Cam, I loved reading this. It’s like being there all over again. 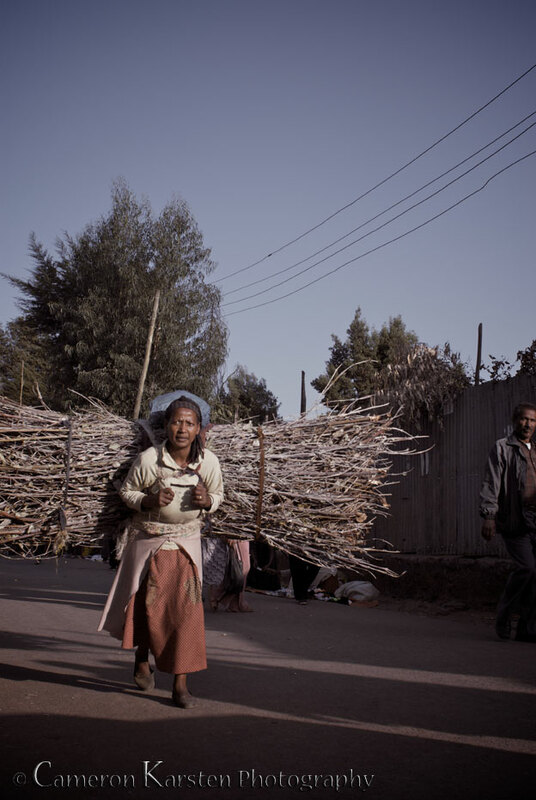 And I love the photos — it’s weird for me to see Addis in SUN! When I was there it was cold and rainy the whole time. It looks so different in sunlight. It’s very cool to remember my own trip and now see it differently thru your eyes. Keep it coming!